2014 is a good to very good vintage, but not in the same league as 2000, 2005, 2009 and 2010 for the reds. Every vintage has its own unique character but, in terms of quality, the red wines of 2014 arguably rank alongside or just ahead of the second tier vintages of 2001, 2006, 2008 and 2012 (the latter having been underrated en primeur, but now showing well in bottle). The 2014s are superior, in general, to their counterparts of 2002, 2003, 2004, 2007, 2011 and, of course, 2013. As for the dry whites, 2014 is a very good vintage – in fact, the dry whites of Bordeaux have been favoured by the weather in the last five years (discounting the hail in the Entre Deux Mers in 2013). For the late picked sweet whites, it’s another excellent vintage to add to the stocks of the lovely 2007, 2009, 2010, 2011 and 2013. Overall then, 2014 could certainly be considered ’the best of the rest’. 2014 has been widely quoted as a ’miracle’ vintage. This is because the outlook was quite gloomy after a damp and cool summer, but we then had six weeks of lovely sunshine from the last week of August to the first week of October. The red harvest began towards the end of September, with just about everyone picking in early October. The week ending the 10th October – when many Left Bank estates wrapped up – was overcast and at times rainy, so I don’t really go with the notion of a perfect Indian summer all the way through. 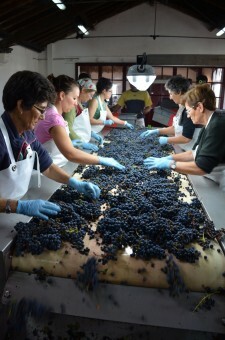 However, there was no pressure of any rot, unlike at the end of the three previous harvests. For more on the weather, see my detailed report. Looking further back during the growing season, it was certainly one of ups and downs. After a mild and wet winter, budburst in late March was fairly early and the vines shot out of the blocks in the April sunshine. It was a good, even start to the season, yet May was wet and chilly – slowing things down considerably. But then, in the nick of time, the first part of June was warm and sunny for the crucial flowering and the early forming of the grapes. Flowering wasn’t uniformly good but it was, on the whole, pretty successful – and vital after some shockingly low yields of 2013. July was relatively damp, and August both damp and cool, although it’s not as if the heavens opened (except on 25 July in some areas). The average rainfall across six key sub-regions was unusually consistent from month to month – March 75mm, April 69mm, May 66mm, June 77mm, July 80mm, August 67mm. What was really challenging for the vines was just how many of days of rain we had in July and August – around one day in two on average, depending on the sector. This lack of hydric stress in July, when the vines needed a signal to stop the vegetative cycle and concentrate their efforts on producing fruit, coupled with average temperatures in August of 2.5°C below the norm, combined to suggest a somewhat mediocre vintage. Mildew was also a threat. Then came the glorious September, with just 37mm of rain on average. A season of highs and lows, fortunately finishing on a high. I tasted around 600 wines over 12 days in late March and early April, including the 250 ’most searched for’ Bordeaux wines on wine-searcher, and here are my observations. There are many really appealing wines with bright, ripe fruit, lovely texture, no rough edges and plenty of freshness for medium term drinking. You’d expect that from the leading chateaux, given the lovely weather in September and early October. Many wines have lovely aromas, good colour and refreshing acidity (notwithstanding that ’acidity’ in reds is a harder sell for consumers) that bodes well for a longer life, despite a rather light tannic frame in many cases. There isn’t the intensity, power and depth that you get in great vintages like 2005, 2009 and 2010. Many wines, while being delicious and fruity, are missing that inner core. There are no truly ’great’ red wines this year, in my opinion, and the lack of real depth and intensity is in keeping with the damp, cool summer. Fresh, yes, but not profound. There are many delicious wines, however, that will provide lots of drinking pleasure. Looking through my notes and scores, I noted over 200 wines that should merit 90 or more when bottled (excellent +) with a further 200 rated as 87 or more (very good) and many more in the mid-80s (good). Stylistically, the 2014s have more in common with recent ’even’ years – a hypothetical blend of the straight-laced, late harvest 2008s, the charming 2012s, the structure of many 2006s and a dash of the penetrating fruit of the 2010s. They’re not like the dry, leathery 2007s, the sun-drenched, robust 2009s or the fairly tannic 2011s. Alcohol levels on the reds are what the Bordelais might call ’classic’, ranging from 12.5% to 14.5%, with the majority around 13% to 13.5%. Many consumers will prefer these levels to the more powerful 2009s and 2010s. Yields aren’t bad, but many estates had smaller crops than they had originally projected. It was quite common to hear of 30-35 hl/ha, rather than 40-45hl/ha (the maximum allowed by law is in the mid-50s). Low yields don’t suggest lower prices. Overall, I was most impressed by the great wines of the northern Médoc – St-Julien and Pauillac, where Cabernet Sauvignon is his nibs, and to a lesser extent, St-Estèphe. St-Julien is probably my favourite appellation in 2014 for sheer pleasure and consistency and if prices are right, these are wines to buy. If not, then wait until after they’re bottled. Margaux had many successes in 2014 but it’s no surprise that it was not as consistent; the appellation spreads over a wider area and covers numerous estates, and rainfall was higher here than in the north. Whilst Pomerol is often favoured over St-Emilion, sometimes due to the sheer size of the latter, there are seriously good wines from both in 2014. Not forgetting that the small production wines of Pomerol can be way beyond most people’s budgets, mind. Many wines with a healthy slice of Cabernet Franc showed well – Ausone, Cheval Blanc, Lafleur, Le Dome, Canon-La-Gaffeliere – but that’s not to take away from Merlot on the great terroirs. If the northern Médoc has the edge, it’s not necessarily down to Cabernet Sauvignon being a later-ripening variety than Merlot, and therefore benefiting more from the autumn sunshine. 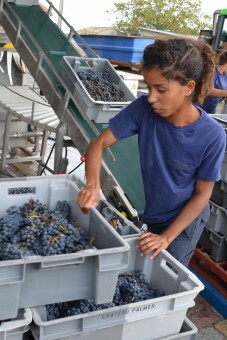 After all, they were picking Merlot on the Right Bank at the same time as the Cabernets were being harvested on the Left. It’s more about how the various varieties performed on the different terroirs. Rainfall at critical times also varied considerably across the region. In the so-called lesser appellations, hundreds of properties have upped their game in recent years and have produced attractive, balanced, fruity wines in 2014. Values can be found in the Haut-Medoc, Médoc, Graves, Fronsac, the Côtes and so on. Whether these are candidates for buying en primeur is another matter but they’ll certainly be worth looking at in more detail after bottling. The wines at the top end feel quite precise. 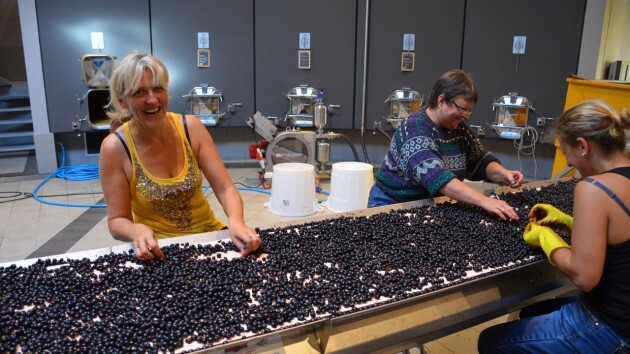 We’re seeing more precision in the wines nowadays, through better viticulture, more flexibility over harvest dates, lower yields, greater sorting, stricter selection of vats, and no end of new kit. Perhaps this is a shame – sometimes we’d like more of a ’warts and all’ approach – but it’s a fact. Elevage will be important, as ever. This is one of Bordeaux’s great strengths and many chateaux have invested heavily in new barrel cellars of late. We can expect the 2014s to put on weight in barrel, and I think many will show better in bottle when the time comes. The late picked sweet whites are among the stars of the vintage: the cool August, the warm September and then the rain around 8 October brought on a final rush of botrytis. The Sauternes and Barsac group tasting was, once again, one of the highlights of the en primeur circus. A detailed and objective review of the vintage. Very informative and useful. Gavin, Many thanks . Most interesting well done glad to see the Haut Brion whites scored well, my son and i visited the chateau late last year. Remind me to place an order for your whites soonest. Good news about the 2014 vintage, certainly an improvement on 2013. Enjoyable reading as always.